I was diagnosed with CF a few weeks after I was born. Skip forward 29 years, and I’m now an MD/PhD student at the University of North Carolina, training for a career as a physician-scientist. I also compete in triathlons, running races, and open-water swimming events. What free time I have after all that is spent with my girlfriend, friends, and family. I recently challenged myself to complete an Ironman race – which was a true challenge. With a combination of hard work and discipline, I was able to complete a race that took me twelve and a half hours – a surreal experience. I wanted to prove that people with CF do not need to be limited by their disease. If I had to give other people with CF a triathlon tip – it would be to start small, have fun, enjoy the challenge, and don’t go out too fast! 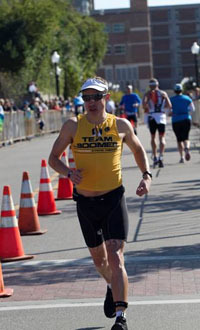 I compete for Team Boomer in triathlons as an outlet. Training gives me a way to focus my energy and my efforts to manage my disease. Competing, in spite of my cystic fibrosis, feels like I am both testing my own limits and facing my disease head-on at the same time.